Often imitated, never duplicated! The Fortress was the original design with real glass windows in a yurt. There are many reasons, and we will cover a few of them in this post. Watch our blog for more great information about this. First of all, the clear acrylic tent windows that are sewn into the wall canvas of most yurts is the very first place that your yurt wall canvas will fail. The wall canvas itself lasts much longer than the clear window acrylic. Next, the inspiration for this new design came out of the desire to create a more secure yurt. With the addition of real thermal windows, and also the wood on the inside walls of the Fortress Yurt, this design is much more secure than the standard tent yurt design. Whether you are worried about two leggeds or four leggeds, this is a much more secure design! We can tell you from many years experience living in yurts, it is so very nice to just walk over to your window and open it from inside. No more having to go outside and roll up windows every time you want to open a window! Often while cooking in your yurt, you may want to adjust the air flow…. now it is easy! Even just sitting around enjoying whatever you are doing, adjusting the air flow is a constant thing. Now it is very easy to do. It is so much easier, we feel spoiled! It took several years to come up with a design with these features that we could still pack up into a crate and ship it around the world! 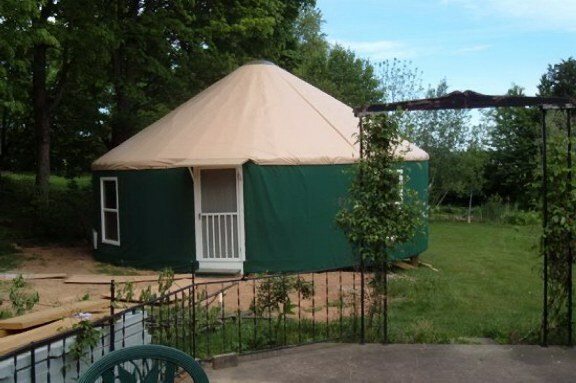 At this point hundreds of yurt owners enjoy this new design, and it all started with the Fortress.